Thermal analysis comprises a group of techniques in which a physical property of a substance is measured as a function of temperature whilst the substance is subjected to a controlled temperature program (ICTAC definition of thermal analysis). Where is thermal analysis used? Quality control, R&D and failure analysis, are areas to which thermal analysis makes a significant contribution. For example, knowledge of melting and crystallization behavior is important for identifying materials in the plastics industry. The food, pharmaceutical and cosmetic industries have many common thermal analysis applications, including the investigation of polymorphism: the property allowing a material to exhibit different crystalline forms. Such knowledge is particularly important for determining shelf life and storage conditions. The most important effects that can be analyzed by DSC are melting point, melting range and melting behavior. DSC is also used to determine the heat of fusion, glass transition, and oxidation stability. TOA is useful for investigating polymorphic transitions, as well as for separating overlapping effects such as melting and decomposition. TGA measures mass changes. The main applications of TGA are content determination, thermal stability, decomposition kinetics, and composition analysis. TMA is normally used to study the expansion, softening or shrinkage of materials and the glass transition. Its unique application is the determination of the Coefficient of Thermal expansion, or CTE. DMA is used to measure the mechanical behavior and properties of materials. This includes the modulus and damping behavior. It is the most sensitive method for measuring and characterizing glass transitions, Tg and sub-Tg relaxations, in materials. Welcome to the METTLER TOLEDO webinar on “Materials Characterization by Thermal Analysis”. Materials characterization is necessary for the study and development new materials. Thermal analysis techniques provide valuable information on the thermal properties of materials, and are relatively simple compared to many alternative methods. This webinar is aimed at getting you familiarized with thermal analysis in general, and demonstrates the common uses of thermal analysis techniques, in various industries, with a number of interesting application examples. This slide summarizes the main topics covered in this seminar. I would like to begin with a general introduction to thermal analysis, where I describe its various applications in different fields. and Dynamic Mechanical Analysis, or DMA. I provide more detail about these techniques later on, using numerous application examples. The seminar is concluded with a summary of the main techniques and applications discussed, together with a list of useful material to further educate yourself on almost any topic related to thermal analysis and its techniques for diverse industries and applications. Quality is an important factor for consumers when deciding whether, or not, to make a purchase. On the left, we see a happy customer, sitting comfortably, in a good quality chair. On the right, however, a fault in the manufacturing process resulted in product failure with serious consequences. In this case, key bearings in the chair failed, causing it to collapse. Such defects are costly, harming both consumer and the reputation of the manufacturer. So, how can a product fail? Most often, product failures are related to design errors, poor quality or unsuitable materials, incorrect materials processing or manufacturing errors. For these reasons, it is vital to determine whether a material exhibits the correct properties for its intended use. Only then, can proper materials be selected and, the necessary production processes, optimized. Typical examples include the identification of polymers by their glass transition temperature, crystallization and melting temperatures, composition analysis and decomposition behavior; or, the determination of mechanical parameters, such as the coefficient of thermal expansion or the modulus. Slide 3: Where can TA be used? Where can thermal analysis be used? Quality control, R&D and failure analysis, are areas to which thermal analysis makes a significant contribution. In quality control, raw materials or final products must be verified to ensure they meet predefined specifications, for example, for purity, composition, mechanical strength and crystallinity, to name just a few. R&D places emphasis on the development of new materials, and the optimization of processing procedures for existing materials. This requires extensive study into the characteristics of new, substitute and modified materials. Existing materials may also need to be evaluated when new production methods are introduced. Quite often, materials fail in their daily use. This slide shows an example of a material, used to make a high temperature-resistant seal. The working temperature range should lie between room temperature and 200 °C. However, it was found that some of the seals failed when heated at a temperature higher than 170 °C. A DSC experiment was devised to identify the cause behind such failures. Curves for "good" and "bad" seals are shown in the diagram on the slide. It can be observed that the "good seal" material undergoes a small glass transition at around one hundred and fifty degrees Celsius, followed by melting, which peaks at approximately three hundred and forty degrees Celsius. From this, we can conclude that most of the material is available in crystalline form. The "bad" material, however, shows a similar magnitude in the Delta Cp value, but is followed by an exothermic peak due to partial crystallization. The melting peak of both samples is identical. The bad material exhibited much lower crystallinity than the good material, since the former was cooled too fast, preventing complete crystallization. During crystallization, the material shrinks. This is the reason for the “bad” seals failing. In this example, the cooling conditions required for complete crystallization can be studied by DSC. DSC can also be used to optimize the processing conditions for the production of such seals. But let’s start at the beginning. What exactly is Thermal Analysis? “A group of techniques in which a physical property of a substance is measured as a function of temperature whilst the substance is subjected to a controlled temperature program”. The schematic diagram on the right shows a simple temperature program with isothermal and linear segments. The bottom part of the slide illustrates typical thermal events and processes that occur when a sample is heated. For example, the melting process, during which a sample transitions from a solid to liquid state, and oxidation; where a sample exposed to air or oxygen will start to oxidize and finally decompose. The Oxidation Induction Time or Temperature (OIT for short) can be determined in oxygen atmosphere. OIT is a commonly used parameter for characterizing the stability of oils and polymers. Thermal analysis techniques are used to investigate all of these effects. Differential Scanning Calorimetry, or DSC dee ess see. This is the most widely used thermal analysis technique. The picture shows a DSC sensor with a sample (colored red) and reference crucible. Thermooptical Analysis, or TOA tee oh ay. This technique allows you to visually follow changes in your sample, which is placed in a hot stage, and mounted on a microscope. Thermogravimetric Analysis, or TGA tee gee ay. This technique measures the mass of the sample as a function of temperature using a highly sensitive balance. Thermomechanical Analysis, or TMA tee em ay. Here we see the sample (colored red) positioned between the fixed, and moving, quartz probes. Dynamic Mechanical Analysis, or DMA dee em ay. The picture shows one of the several available sample clamping assemblies, in this case—compression mode. I will explain these techniques in more detail in the following slides, which also include examples of useful applications. The table lists the most important industries for thermal analysis, and their corresponding applications. For instance, knowledge of melting and crystallization behavior is important for identifying materials in the plastics industry. For thermosets or adhesives, gelation or curing times at different temperatures, are critical parameters that affect their daily use. Elastomers or rubbers are widely used in many sectors, such as the automotive industry for the manufacturing of tires, hoses and suspension components, as well as the construction industry, for sealing materials, bridge bearings and damping materials. The main properties investigated are glass transition, composition, expansion, the modulus, and damping and creep behavior. The food, pharmaceutical and cosmetic industries havemanycommon thermal analysis applications, including the investigation of Polymorphism: the property allowing a material to exist in different crystalline forms, with varying moisture content and structural stability. This is particularly important for shelf life and determining storage conditions. I will now discuss the different thermal analysis techniques in some more detail. The standard METTLER TOLEDO DSC measures samples from minus one hundred and fifty degrees Celsius to plus seven hundred degrees Celsius, at heating rates of up to three hundred Kelvin per minute. The samples are normally measured in small crucibles made of aluminum, alumina or other materials, using one to twenty milligrams of sample material. The METTLER TOLEDO Flash DSC expands the maximum heating rate to two million four hundred thousand Kelvin per minute and the cooling rate to two hundred and forty thousand Kelvin per minute. To achieve this, the Flash DSC 1 uses very small samples weighing about one hundred nanograms and no sample crucibles, as the sample is placed directly onto the chip-sensor. The ultra-fast heating and cooling rates allow industrial process conditions to be simulated where materials frequently undergo extremely rapid cooling rates. Another powerful DSC technique is high-pressure DSC or HPDSC for short. The METTLER TOLEDO HP DSC can analyze samples exposed to inert-gas- or reactive-gas-atmospheres, and at pressures of up to one hundred bar or ten mega-pascals. This suppresses undesired vaporization and enables the stability of samples to be studied e.g. at increased oxygen pressures. Six, is exothermic oxidative decomposition. The table on the left of the slide summarizes the most common analytical applications for which DSC is employed. DSC is used to investigate events and processes such as glass transitions, melting, crystallization, chemical reactions, and thermal stability. All of these events involve an enthalpy change, which is readily observed by DSC. The information obtained can be used to identify polymers, investigate the working range of materials, and for compositional analysis. Suitable methods can easily be developed for quality control and for the analysis of raw materials, additives, and fillers. Finally, the technique can also be used to evaluate vulcanization and other reactions. DSC curves also contain information about the thermal history of a sample, for example ageing. The stability of materials can be determined using the oxidation induction time or OIT for short. Other important applications include investigating curing kinetics of reactive systems, or the influence of stabilizers, plasticizers or other additives. Most of these events demonstrate enthalpy changes that occur when the temperature is increased or decreased. The picture on the right hand side offers a view of an open DSC furnace with samples and reference crucibles. The standard crucibles are made of aluminum. METTLER TOLEDO has also developed versatile optical techniques that allow you to observe changes that occur in a sample while it is heated or cooled. The techniques include DSC-Microscopy and DSC-Chemiluminescence. The Photocalorimetry Option is used in combination with the DSC and allows the study of the cure process for adhesives or paints, under visible or UV light. The slide shows examples of polymer “fingerprinting”. The diagram displays the glass transition, melting and crystallization curves of several commonly used polymers. Curves like these allow the identification of polymers and provide an easy way to compare different batches of the same material. Glass transitions and melting peaks are the most common effects measured. Quantitatively, a melting peak is characterized by its peak temperature and the enthalpy of melting. The normalized enthalpy for the melting of a sample can also be used to quantify its crystallinity, if suitable reference materials, or reference values, are available. Glass transitions are characterized by a step-like change in the heat flow or enthalpy. In the first heating run, the transition is often accompanied by a peak related to enthalpy relaxation, caused by ageing. An example of this can be seen in the DSC curve of PET. Large enthalpy relaxation peaks only appear in the first heating run, as the heating erases the ageing history. The temperatures, at which glass transition and melting occur, define the usable temperature range for manufactured parts. Crystallization is normally measured during cooling of the sample from the melt. The DSC curves of two PBT samples—see bottom of graph—illustrate the effect of additives on the crystallization behavior—in this case, carbon black, which is used as a colorant and UV stabilizer. 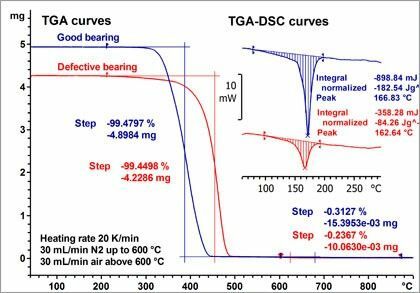 Another important application for differential scanning calorimetry is to measure the curing reaction in thermosetting materials. The diagram displays the DSC curves of three samples that were cured to different extents. The results show that, with an increasing degree of cure, the glass transition shifts to higher temperatures, and the enthalpy of the post-curing reaction decreases. In the diagram, the degree of cure increases from top to bottom, starting with the blue curve of the uncured sample to the black curve of the fully cured sample. If the reaction enthalpy of the uncured material is known, the degree of conversion, before the measurement, can be calculated from the enthalpy of the post-curing reaction. Many materials such as polymers, oils or food start to degrade after a certain time when exposed to oxygen. The oxidation induction time test is frequently used to characterize the oxidation stability of materials. Detailed procedures are defined in various ASTM and ISO methods. The general method used for such experiments is shown by the blue curve in this slide. Initially the test specimen is rapidly heated, in an inert atmosphere to a temperature at which the oxidation is expected to occur, within a reasonable amount of time (typically 30 minutes). An equilibration time at this temperature ensures thermal equilibrium before the atmosphere is changed to oxygen or air. The oxidation induction time, or OIT for short, is the time it takes until oxidation begins. This is detected as an exothermic upturn of the heat flow, and the time is measured from the intersection of the tangents, before and after the event. The OIT is directly related to the relative stability of a material at a particular temperature. In the example shown here OIT measurements were performed at 210 two hundred and ten degrees Celsius on polyethylene tubing which had been exposed to flowing aqueous solutions of chemicals for some time. Two test specimens, one from the outer and the other from the inner side of the tubing, had their respective OIT evaluated. The test specimen originating from the inner side of the tubing, is denoted as "Stressed", and the test specimen originating from the outer side of the tubing as "unstressed". Their DSC curves are shown in red and black, respectively. The dramatic decrease in the OIT value obtained for the “stressed” sample shows the damage caused by the chemicals transported in the tubing. Since the OIT measurement temperature is usually far above the temperature at which the material is normally used, OIT experiments are known as accelerated ageing tests. The method is frequently used to study the influence of anti-oxidants, or other stabilizers, on the stability of a material. In the absence of any additives, information can be obtained on comparative molecular weights. The larger the OIT value, the higher the molecular weight. Polymorphism is the ability of a single material to exist in different crystalline structures. This is of particular interest for food stuffs, and pharmaceuticals, where the bioavailability of, for instance, a drug depends on the structure of the active pharmaceutical ingredient. DSC is a simple and quick screening tool to identify the presence of different polymorphs. The example shown here presents the heating curves of sulfapyridine, which is used for its antibacterial effects. The sample was first heated to 200 °C (see the blue curve). The sharp endothermic peak at around 190 degrees Celsius indicates the melting of the stable structure. After heating, the melt was shock cooled by simply placing the sample pan with the sample robot onto the turntable of the sample robot. The second heating run, shown by the red curve, first shows a glass transition. This tells us that the sample did not crystallize during cooling. The glass transition is followed by an exothermic cold crystallization. The crystals formed are partially metastable. The metastable crystals transform to a more stable modification through an exothermic monotropic solid-solid transition at around 120 one hundred and twenty degrees Celsius. This modification then melts at 179 one hundred and seventy-nine degrees Celsius. Part of the molten crystals then crystallize into the most stable phase, which finally melts at 190 one hundred and ninety degrees Celsius. To discover the different polymorphs of a material, one has to heat and cool the sample at different heating and cooling rates. The appearance of different melting peaks is characteristic of a sample exhibiting polymorphism. The next slide shows an application example involving the use of an ultra-fast scanning DSC instrument, the Flash DSC 1. This instrument allows measurements to be made at heating rates of up to two million four hundred thousand Kelvin per minute and at cooling rates of up to two hundred thousand Kelvin per minute. To achieve this, the Flash DSC 1 requires a typical sample mass of a few hundred nanograms. The tiny samples are put directly on the chip sensor, which is mounted into the flash DSC. If a semicrystalline polymer is measured with a conventional DSC instrument, the DSC curves generally exhibit a glass transition whose step height is proportional to the amorphous material content and an endothermic peak, which is related to the melting of the crystalline component. In some materials, an exothermic event known as cold crystallization can occur between the glass transition and the melting peak. Cold crystallization is a reorganizational process, which changes the structure of the material. Consequently, the structure of the sample may be changed during heating from the glass transition onwards. In other words, what is measured as a melting peak is not necessarily representative of the original structure of the sample. If one is interested in the original structure of a material one has to heat up a test specimen at a heating rate high enough to prevent such reorganization. This minimum heating rate will depend on the material and can only be determined experimentally. The slide illustrates a reorganization process using isotactic polypropylene. The test specimen has been cooled from the melt at a cooling rate of four thousand degrees per second, before each heating measurement. With this cooling rate, crystallization is suppressed, resulting in a fully amorphous test specimen. Each curve represents a heating run performed at the indicated heating rate. The glass transition appears as step at about zero degree Celsius. This is immediately followed by an exothermic peak, which we attribute to the cold crystallization. This peak is sensitive to the heating rate, increasing from about twenty to eighty degrees Celsius for the rates shown. Before the melting process we find another small exothermic peak, which represents a reorganization process. It can be seen that all these effects depend on the heating rate. Only at heating rates above 20,000 K/s, is reorganization completely suppressed. Therefore, in order to study the original structure of an iPP sample, it is imperative to use heating rates of at least 20,000 K/s. Now let’s turn our attention to thermo-optical analysis, or TOA. TOA is performed by using a hot-stage mounted on a microscope, as shown on this slide. A hot-stage is a special cell into which a sample is inserted on a slide and is then heated or cooled or held at constant temperature. During the temperature program, images of the sample are continuously captured in transmission, using a suitable camera. Processes such as decomposition, solid-solid transitions, and melting or crystallization can then be observed in situ. Polarized light is often used to improve the images of crystals. Thermo-optical analysis is particularly useful when investigating the shrinkage of e.g. fibers, crystallization (during heating, cooling or under isothermal conditions), polymorphism, melting and thermal stability, as it affords unique insight into these processes, as we shall see in the next slide. In this slide, we illustrate the use of hot-stage microscopy with a sulphapyridin sample, as demonstrated in the DSC curve in a previous slide. From the DSC experiment, we suspect polymorphism. This is confirmed using a hot-stage, with image capture of the different crystalline forms. For the hot-stage experiment, the sample was also quenched from the melt, and initial heating rate was the same as for the DSC experiment. Some images recorded at selected temperatures during heating are shown together with the respective DSC curve. The images were obtained using polarized light. The image recorded at 120 °C one hundred and twenty degrees Celsius shows that, during the cold crystallization, different types of crystals were formed. After the monotropic solid-solid transition, some new large crystals are present. The less stable crystals melt at around 175 °C. A part of the melt crystallizes to the most stable crystals. The stable crystals finally melt at around 192 °C. Now let’s move on to thermogravimetric analysis, or TGA. In this technique, the mass of a sample is continuously measured as it is heated in a defined atmosphere. We simply put a few milligrams of sample into a crucible, heat it, and continuously record the mass change. This allows us to obtain information on the composition of the sample. Four: the carbon black burns. Five: a residue consisting of ash, fillers, glass fibers, etc. remains behind. The picture on the right shows a view of the open furnace of a TGA/DSC instrument, emphasizing the sample holder with positions for the sample and reference crucibles. The standard crucibles are made of alumina. The table on the left side of the slide summarizes the main analytical applications of TGA. TGA is used to investigate processes such as vaporization or decomposition. It allows you to measure thermal stability, the kinetics of reactions, and reaction stoichiometry. The combination of TGA with a mass spectrometer, a Fourier-transform-infrared-spectrometer, or a GC-MS system allows you to identify gaseous compounds evolved during the analysis. METTLER TOLEDO TGA/DSC's instruments simultaneously measure the heat flow together with the weight change. This can be used to identify processes such as melting or solid-solid transitions that are not related to mass changes. Also, the DSC can be used to determine the specific heat capacity of a material at high temperatures. 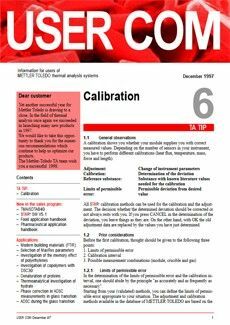 The first TGA application example shows the analysis of an elastomer or rubber material. The sample was first heated to eight hundred degrees under inert conditions. At eight hundred degrees, the atmosphere was switched from nitrogen to oxygen. The upper curve shows the weight trace (TGA) and the lower curve shows its first derivative. The first weight loss step, which is usually between room temperature and three hundred degrees, comprises volatile components such as plasticizers, oils, moisture, or solvent residues. The sample then pyrolyzes in a single step. From this, we can conclude that the sample consists of a single polymer. Usually, loss of volatiles and depolymerisation overlap. This can also be seen on the first derivative of the TGA curve in the lower curve. In order to get a better separation of the volatiles and the pyrolysis step, the TGA/DSC is operated at reduced pressure. At eight hundred degrees, the atmosphere was switched from nitrogen to air. This resulted in the combustion of the carbon black used as filler in the rubber. Finally, at one thousand degrees, inorganic components remain as a residue. and thirty-five-point-nine percent of carbon black. The residue of about 3.2 % includes some inorganic materials such as ZnO used as catalysts for the vulcanization. 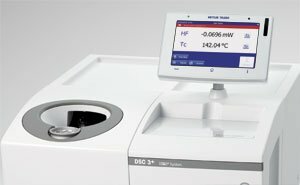 The METTLER TOLEDO TGA/DSC's instruments can simultaneously measure the heat flow originating from melting or decomposition reactions. This is illustrated in this slide. The simultaneous measurement of the heat flow also allows the detection of events that are not related to a mass change. Calcium carbonate is widely used as a filler in the polymer industry. Due to its hydrophilic nature, it is incompatible with some of the most common polymers, such as polyethylene and polypropylene. To ensure compatibility, calcium carbonate is frequently coated with stearic acid. Stearic acid forms a mono-layered array of alkyl chains on the surface of calcium carbonate particles, oriented with the carboxylic groups adjacent to the calcium carbonate surface. With excess stearic acid, additional layers may be formed. A minimum amount of stearic acid is needed to ensure compatibility. With excessive amounts of stearic acid, the mechanical properties are affected, and the cost is greater. Thus, the amount of stearic acid on the calcium carbonate particles’ surface is crucial, from both a technical and an economic standpoint. Using TGA, the amount of stearic acid on the calcium carbonate can be accurately determined. This is illustrated on the slide. The sample was heated in oxygen from room temperature to four hundred degrees, in an aluminum pan with a pierced lid. The upper curve is the TGA curve. Between room temperature and one hundred and eighty degrees, a small mass loss of about zero-point-two percent is measured. This can be attributed to the release of moisture or other volatiles. At higher temperatures, two distinct steps are observed, which are due to the oxidation of the second and the first layer of stearic acid. The total amount of stearic acid on the calcium carbonate is the sum of these two steps. In this example, this amounts to one-point-four-eight percent. The DSC curve simultaneously recorded with the TGA curve is show at the bottom of this slide. The oxidation behavior of the organic coating can be seen on the DSC curve as an exothermic peak. The oxidation onset temperature for the second layer starts at around two hundred degrees, while the oxidation of the first layer occurs at about two hundred and fifty degrees. With such experiments, the optimum amount of stearic acid coating the calcium carbonate particles can be determined. The METTLER TOLEDO TGA/DSC's can be interfaced with several evolved gas analyzers, such as a mass spectrometer, MS, Fourier transform Infra-red spectrometer, FTIR, or a combination of a gas chromatograph and a mass spectrometer. This allows the identification of released products and increases the power of TGA considerably. Such coupled systems are used in many fields, for example, in the plastics, pharmaceutical and rubber industries for the identification of decomposition products, additives or solvents. Solvents are often used both for the synthesis of a pharmaceutical substance and for its purification or recrystallization. The unwanted presence of residual amounts of solvents in a drug has to be quantified and their concentration kept as low as possible. The slide shows the results of an experiment, in which the residual solvents were identified in an active pharmaceutical ingredient by using the TGA-MS technique. The TGA curve exhibits several mass loss steps. In the final step, above two hundred and fifty degrees, the substance starts to decompose. The two steps in the range of one hundred and twenty degrees to two hundred and forty degrees indicate that moisture or solvents are lost through heating. The simultaneously recorded mass spectrometer ion curves show that the mass loss steps correspond to methanol and acetone. From the TGA experiment, one can therefore estimate that the sample contained around 2% and 5% of methanol and acetone, respectively. Such concentrations for acetone are unacceptable according to regulations. The manufacturing process therefore needs to be modified to bring the residual concentration of acetone within the specified limits. We now move on to thermomechanical analysis, or TMA. This technique measures the dimensional changes of a sample as it is heated or cooled. The schematic curve on the left shows the result from a typical TMA measurement on a sample mounted in compression, with a small applied load. The effects are numbered next to the curve and explained in the table. The table on the left summarizes different analytical applications of TMA. A TMA measures dimensional changes of a sample under a defined load. This information can be used to determine the coefficient of thermal expansion. Furthermore, other thermal effects such as glass transitions, melting, crystallization, polymorphism, curing or swelling behavior, can be investigated. Besides conventional TMA measurements, in which the load remains constant, Dynamic Load TMA or DLTMA can also be performed. This mode typically employs a periodic applied load with a constant amplitude, for example, plus and minus one Newton. If a sample hardens, as in the cure process, the measured displacement amplitude decreases markedly. This technique can be used to determine Young’s modulus. The picture on the right shows a typical TMA configuration where a ball-point probe is in contact with a blue sample resting on a flat support. The probe penetrates the sample as it softens. In the following slides, I will describe specific application examples. Materials expand or contract with changing temperature. Thermal expansion in a part containing multiple materials may result in cracks or failure of the component. Therefore, knowledge of the coefficient of thermal expansion, CTE, is an important requirement for preventing product failures. One major application of TMA is the determination of the coefficient of thermal expansion. This can be carried out for bulk materials, as well as for thin films and fibers. The main diagram in this slide shows TMA curves for three different materials with increasing temperature. The smaller inset shows the coefficient of thermal expansion as a function of temperature. The materials include Invar, a nickel steel alloy with 36% nickel, which has practically zero thermal expansion at ambient temperature. Duran glass, like most mineral glasses, has a very low coefficient of expansion below the glass transition temperature. Crystalline quartz, measured here in the c-axis direction, expands steadily up to the solid-solid transition at about 575 five hundred and seventy five degrees Celsius, after which it begins to contract. An adhesive is shown initially in its liquid state. During isothermal cure, the viscosity of the adhesive increases, as cure or crosslinking progresses. From a technical point of view, the so called gel point, or pot time, is of major interest. It denotes the time at which the repositioning of parts, in the evolved structure, is no longer possible. To determine this gelation time a Dynamic Load TMA or DLTMA has been used. In this mode, the sample is subjected to alternating forces. In the example, we were applying forces of plus-minus 0.1 N. The respective force profile is shown in the upper right diagram. If the sample is still liquid, the probe lifts off the sample at the negative force. This explains the large displacement amplitude during the first 20 minutes of the experiment. With progressive curing the viscosity of the sample increases and the samples become increasingly sticky. This reduces the displacement amplitude dramatically. When the sample is fully cured and the material is in a glassy state, the displacement amplitude is effectively given by the stiffness of the instrument, since the measurement probes become stuck together by the sample. The time at which the displacement amplitude starts to decrease, corresponds to the gel point, or pot or gelation time. In the example, the gelation time at 10 °C ten degrees Celsius is about 26 twenty six minutes. Dynamic Mechanical Analysis measures a sample's response to deformation as a function of time, temperature and/or frequency. The schematic diagram on the left shows the results obtained from a DMA shear measurement of a crash-cooled semi-crystalline polymer. The curves display the storage modulus, gee prime, the loss modulus, gee double prime,and the loss factor, tan delta, as a function of temperature. Three: cold crystallization of the polymer. The stiffness and hence the storage modulus, gee prime, increase, together with some activity in tan delta. Five: melting of the crystalline fraction with a drastic decrease in both the storage modulus, gee prime and loss modulus, gee double prime. After melting, tan delta, or the loss factor, increases considerably. Gee double prime is then larger than gee prime. The table on the left lists the main analytical applications of DMA. In general, DMA provides information about relaxation processes such as the glass transition or secondary relaxations. Curing processes, pot or gelation time, melting, and crystallization are other application possibilities that can be studied by DMA. DMA is also widely used in a humidity-controlled environment to study the effect of moisture on material properties. Quantitatively, DMA provides accurate data on the shear and Young's modulus as a function of temperature and frequency. Furthermore, the impact of the deformation amplitude or strain dependence on the modulus can be investigated. This is of particular importance for filled rubbers. The picture on the right shows a sample installed in the DMA, in one of the bending modes. Nowadays, fiber reinforced polymers are widely used, for instance, in aviation and automotive industries. Such composite materials offer moduli and elasticities similar to metals, and are considerably lighter. Furthermore, they can be shaped into almost any geometry. Such properties make composites a cost-effective solution for many applications. The slide shows the DMA curves of a glass fiber reinforced epoxy composite measured in single cantilever mode from minus one hundred and twenty to three hundred degrees Celsius. From top to bottom, the diagram shows the curves of the storage modulus, eee prime, loss modulus, eee double prime and the tan delta curve. The glass transition temperature limits the temperature range, in which a composite can be used. DMA is the most sensitive method available for measuring glass transition, particularly, in highly filled materials, such as composites. In DMA, a step in the storage modulus, and a peak in both the loss modulus and the tan delta curve, characterize the glass transition, sometimes also called the alpha transition. The glass transition temperature is frequently characterized, either by the onset temperature of the eee prime, or by the peak temperatures of either the eee double prime or tan delta curve. The 3 temperatures will always differ. Furthermore, the onset temperature of eee prime depends on the representation of the eee prime curve: if E prime is displayed on a logarithmic scale, the onset temperature will generally be lower, compared to a linear scale. Therefore, one usually prefers the inflexion of eee prime curves, or peak temperatures in eee double prime or tan delta, as characteristic temperatures for glass transition. Other than glass transition, or Tg, other sub-Tg relaxation processes, also known as secondary relaxations, can be seen by DMA. Such transitions are usually not detected by DSC. The highest temperature relaxation is typically referred to as the alpha relaxation, whereas lower temperature relaxations are named beta, gamma and so on. The alpha relaxation is usually the glass transition process, while the lower temperature transitions involve more localized molecular deformations, either in side groups, or the main chain. They always occur below the glass transition temperature. Similar to the glass transition temperature, they are characterized by a step like change of the modulus and by frequency dependent peaks on both the loss modulus and tan delta curves. They generally have a lower activation energy than the glass transition. The use of a multiple frequency thermal scan means that relaxations can easily be separated from other events, such as melting and water evaporation, since these exhibit no frequency dependence. Secondary relaxations play an important role in the impact resistance of materials. The mechanical properties of materials change with temperature and frequency. For many applications, this has a crucial bearing on their performance. Therefore, the frequency dependence of the modulus and damping, as seen by tan delta, are extremely important. For example, an adhesive must absorb stresses in spite of temperature fluctuations during day and night cycles, that is, low frequency variations. However, the adhesive must also react elastically to short term mechanical impacts, reflecting high frequency variations. The slide shows a frequency sweep across the glass transition of a styrene-butadiene rubber or SBR for short. The measurement was performed isothermally at minus 10 degrees Celsius. The frequency ranges from one milli-Hertz to one kilo-Hertz. In this frequency range, gee prime changes by around three decades. The maximum value of tan delta is reached at about zero-point-three hertz. At low frequency, the material is soft and behaves in a rubbery manner. As frequency increases, the material stiffens and becomes glassy. This demonstrates the ability of this material to behave like a rubber at frequencies in the millihertz range and, conversely, to behave in a glassy fashion at frequencies in the kilohertz range, while being held at the same temperature. Thermal analysis comprises a number of easy to use, and powerful, techniques for characterizing thermal properties of materials such as those for thermoplastics, thermosets, elastomers, adhesives, chemicals, paints and lacquers, foodstuffs, pharmaceuticals, fats and oils, metals and ceramics. The table summarizes the most important events and properties that characterize materials as well as the thermal analysis techniques recommended for their measurement. A red box means that the technique is strongly recommended; a blue box signifies that the technique can only be used in certain cases. with decomposition, melting and crystallization behavior. 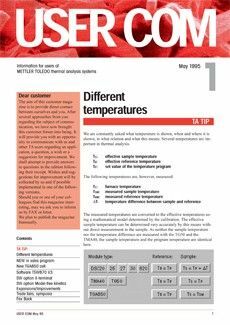 This slide gives an overview of the temperature ranges available on METTLER TOLEDO DSC, TGA, TMA, DMA and TOA instruments. Depending on the specific cooling accessories, DSC experiments can be performed at temperatures between minus one hundred and fifty degrees Celsius and plus seven hundred degrees. TGA measurements normally begin at room temperature. The maximum possible temperature is one thousand six hundred degrees Celsius. TMA experiments can be performed between minus one hundred and fifty degrees and plus eleven hundred degrees. DMA samples are measured in the range of minus one hundred and fifty degrees to plus six hundred degrees. Finally, I would like to draw your attention to additional sources of information, including application examples, that you can download from the Internet. 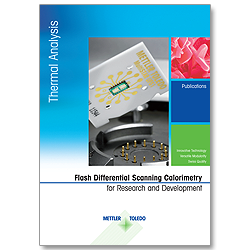 METTLER TOLEDO publishes articles on thermal analysis and applications from different fields, twice per year, in their TA UserComs, the well-known METTLER TOLEDO technical customer magazine. Back issues can be downloaded for free as PDFs at www.mt.com/ta-usercoms as shown on the slide. Our “Collected Applications” and “Thermal Analysis in Practice” handbooks contain many other examples, and are highly recommended for further reading. In addition, you can access webinars, application handbooks, or information of a more general nature, from the internet addresses given on this slide, ensuring that you are always fully up-to-date in thermal analysis. This concludes my presentation on Materials Characterization by Thermal Analysis. Thank you very much for your interest and attention. Thermal analysis applications, including useful tips on the meaning and representation of different temperatures in thermal analysis. 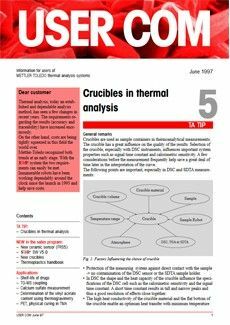 Thermal analysis applications, including useful tips for crucible selection.